Download ESXi ISO from www.vmware.com. 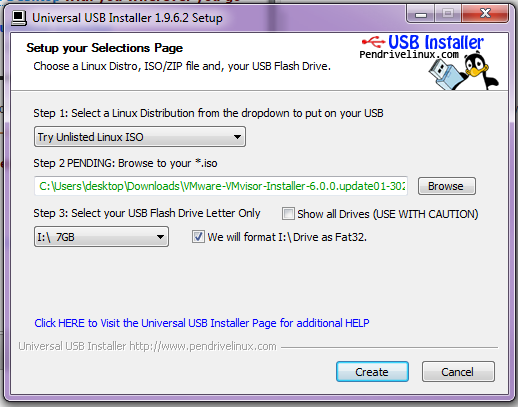 Download the Universal USB Installer (UUI) from www.pendrivelinux.com. Connect a USB flash drive to your computer. 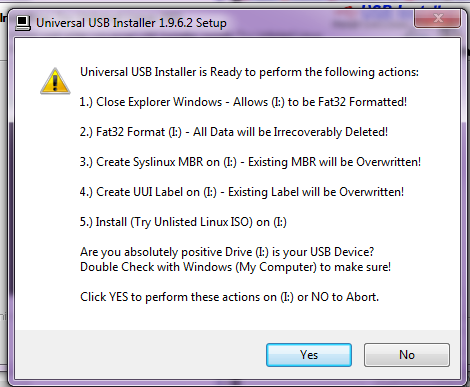 In your Downloads folder, double-click Universal USB Installer. Step 1: Select Try Unlisted Linux ISO. Step 2: Select your VMWare ESX iso. Step 3: Select your USB flash drive. Also check the option to format the drive. Be aware that this will erase all data on the flash drive, so if you have data on the flash drive you need, copy the data. Select Create. A warning will appear. In the warning, select Yes. Once completed, a completed message will appear. Select Close. Your flash drive will now be listed as UUI and will contain many system files. Insert the USB flash drive into the computer where you want to install VMWare ESXi hypervisor. You may need to enter BIOS and adjust the boot order to boot from the USB flash drive. IMPORTANT: The following steps will completely wipe your computers drive and establish VMWare ESXi as the host system. Follow the prompts of the ESXi installer.